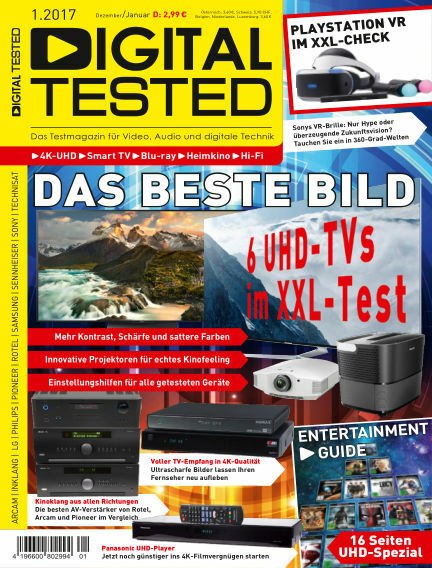 16 | Samsung 55KS8090: UHD-Premium-Bildqualität ohne Curved-Effekt zum Kampfpreis. Kommt hier der ideale Gaming-TV? 24 | HDR-Gaming in der Praxis: Welche Fernseher setzen Eingabebefehle mit HDR-Quellen am reaktionsschnellsten um? With Readly you can read DIGITAL TESTED (issue 01/2017) and thousands of other magazines on your tablet and smartphone. Get access to all with just one subscription. New releases and back issues – all included.